My parents have always enjoyed traveling. After all, they are who gave me the travel gene (that’s a thing, right?)! Lucky for us, their summer travels brought them to Maine for a visit. Neither of my parents had ever been to Maine, so when they knew Russ & I would be here for several months, they started planning a lengthy road trip. With many fun stops along the way in Rhode Island, Connecticut, & Massachusetts they rolled into the cute cottages across the street from our campground on Thursday afternoon. After getting back from work, I walked over to catch up with them on their travels so far. It was fun to hear about all the places they stopped, some of which we also visited on our way up to Maine and others we have to save for a future visit. Since Russ was working late, we went to the lobster pound right across the street from us. My Dad enjoyed his first lobster roll and clam chowder (more on this later) and my Mom enjoyed fresh fish & chips. The boring girl in the group (me) noshed on a simple, but tasty grilled cheese. We made plans for the next day and decided to call it a night. Friday morning we put on our tour guide hats and headed off to Acadia National Park with my Mom & Dad. While, Russ & I have explored much of the park, we had yet to visit the Hulls Cove Visitor’s Center. We decided that would be a great place to start our tour. Just to be aware, when you arrive in the parking lot you can not see the visitor center as it is located 52 steps up the hill. This is where we explained to my Mom & Dad that there is no such thing as flat roads, trails, or paths on Mount Desert Island. My Mom took that news much better than my Dad! Atop the 52 steps, we entered the Hulls Cove Visitor’s Center. Compared to other National Park visitor’s centers we have been to, this one was fairly small. However there was a good selection of books about the park and numerous park rangers available to answer questions from the best hiking trails to the easiest way to get to all of Acadia’s hotspots. While you are there make sure to catch the short introductory film about the park that is worth the 15 minutes it takes to watch. If you are in need of a parks pass or map, you can most certainly obtain those there as well. The visitor’s center is the official start of Park Loop Road, so we continued on the 27-mile loop to our next destination - Thunder Hole. Timing is everything, at least it is at Thunder Hole. We had planned our departure time in the morning based on the best time to experience Thunder Hole which is 2 hours before high tide. While crowded, we found a lucky parking spot right across from the stairway down to Thunder Hole. Thunder Hole is a small inlet that is naturally carved into the rocks that line the rocky coast of Mount Desert Island. At the top of the inlet is a small “hole” that when waves rush into the inlet the force of the air and water creates a thunderous sound. At low tide the water does not have enough force to create the loud noise. We arrived about 30 minutes prior to the optimal time (2 hours before high tide) and watched as the tide quickly came in. We heard some gurgling and loud crashing, but didn’t get to experience the thunderous burst or forty foot sprays. The beautifully calm, sunny day was a great trade-off for the lack of those thunderous music. Even though we had high hopes of hearing the famous thunder, the attraction is still worth a stop. The views are pretty spectacular along the rocky Maine coastline and the rock formations created by the glaciers and thousands of years of crashing waves are intriguing. We continued along Park Loop Road enjoying the magnificent views of Otter Cliffs and parked again to enjoy the view at Otter Cove. We waled toward the end of the Ocean Trail and even spotted a few jellyfish gliding through the water. 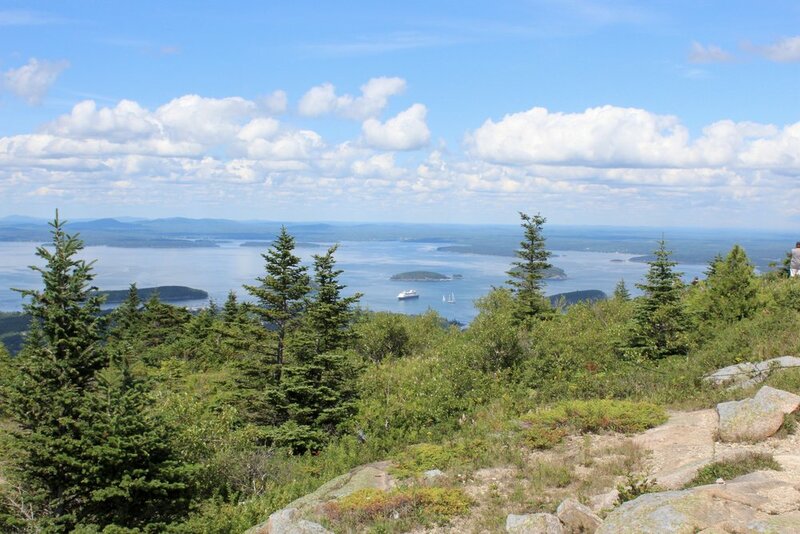 As we continued around Park Loop Road, our next planned stop was Cadillac Mountain. The drive to the summit is beautiful and thanks to our private driver, Russ, the rest of us could enjoy the views as we made the ascent. My dad who isn’t overly keen of heights was also glad it was Russ rather than him behind the wheel. Ever since our first trip to Cadillac, I recommend to anyone visiting Acadia to check it out early during their stay. It provides a good perspective to figure out the lay of the land. From the top we were able to point out Eagle Lake, the Cranberry Islands, Bar Island, the Porcupine Islands, Schoodic Peninsula, downtown Bar Harbor, and the direction of our campground & my parent’s cottage. My parents were in awe of the amount of big rocks that are seen just about everywhere on the island and Cadillac Mountain is no exception. 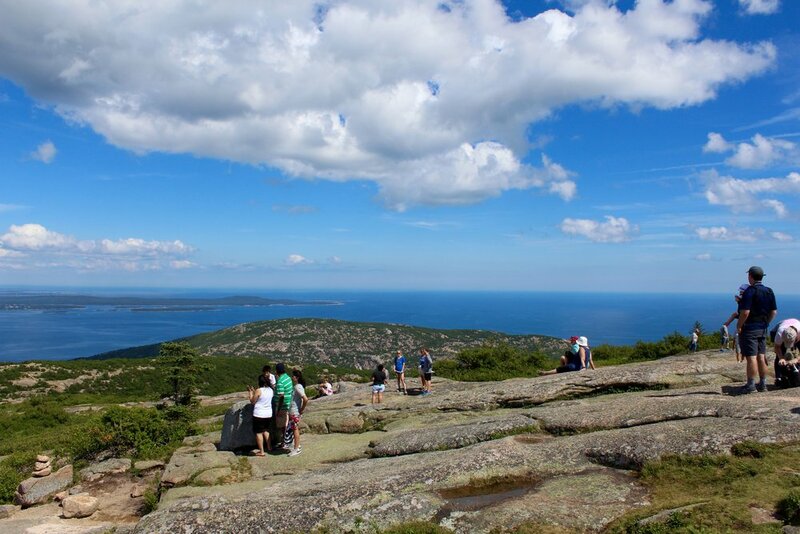 The peak of the mountain is dotted with lots of pink granite boulders and even a few wild blueberry bushes to enjoy. We traversed the short paved Cadillac Summit Path before heading back to the car. We finished up Park Loop road and headed into Bar Harbor to give my parents their first snapshot of the touristy town where we work. We pointed out some of the highlights and we knew they would have time to explore all the shops of Bar Harbor another day. We showed them the office of Acadia Bike & Coastal Kayaking where we work as well as a quick tour of the bike shop and back deck. We finished off the evening with dinner at West Street Cafe and ice cream from our favorite place in Bar Harbor, Ben & Bill’s Chocolate Emporium. On Saturday, both Russ and I had to work. My Mom & Dad hitched a ride with me into Bar Harbor. I headed to work and they headed to explore the town. They took some time to learn about the history and culture of Maine’s Native Americans, the Wabanaki at the Abbe Museum. They followed that up with lunch at Testa’s where my Dad kept his streak of a cup of New England Clam chowder alive (7 or so days straight)! That takes some dedication, but he took the assignment very seriously! Hope his doctor isn’t reading this post. If so, sorry Dad for ratting you out. Shortly after they finished eating, I texted to find out their location. They were right near Agamont Park, a beautiful grassy area that overlooks the harbor. I headed to the park with my packed lunch and they were able to join me on the bench. That was an added bonus during my work day. They were planning to check out the shops for the rest of the afternoon. After I finished off my shift, I found out they were still in town. 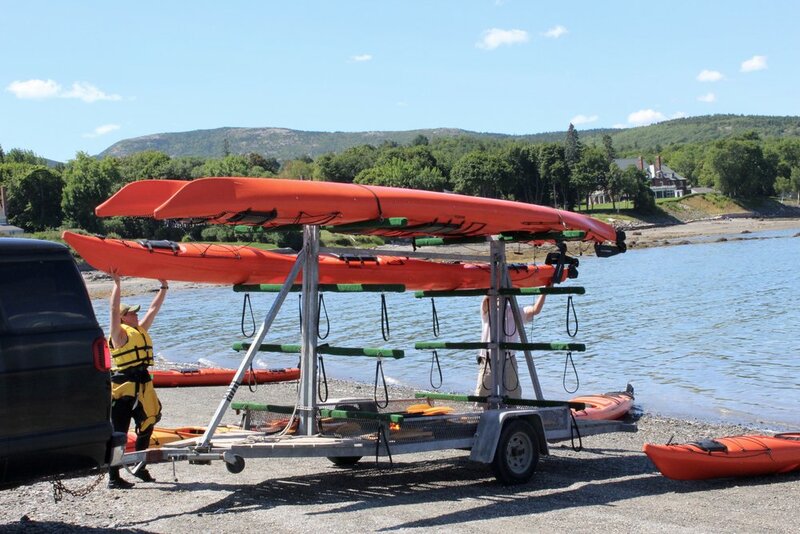 They had enjoyed checking out the touristy parts of Bar Harbor as well as the artsy and stone & gem shops in town. We decided to wait until Russ got off work after the sunset tours to grab dinner at Side Street Cafe. We had a tasty dinner before heading back to Trenton, Maine for the evening. Over the last few days, we picked Sunday as our day to walk over to Bar Island. Okay so our decision was made by the day that would allow us to sleep in the longest and still safely traverse the Sand Bar. As we walked across the Sand Bar, we talked about the tides and all the funny Sand Bar stories we have heard, like the one family who thought the Sand Bar wasn’t exposed because it probably closes early on Sundays! What? Seriously?? We got to watch a few of our kayak tour launch from the Sand Bar, which my parents enjoyed so they had a better idea of what Russ does day in and day out. Once we crossed over to Bar Island, my Dad found a nice shady spot to sit and enjoy the view while Russ, my Mom, and I headed up the path. We walked to the overlook which provides a unique view of Bar Harbor. We took a photo and just then we spotted my Dad who decided to hike up too! He didn’t even stay long enough for a photo as he didn’t want us to pass him on the way back. He was moving at a pretty good pace as it took us quite awhile to catch up with him on the descent. We leisurely walked back across the Sand Bar and found a seat along the rock wall. We watched as the Sand Bar started to disappear as the tide was coming in. We sat there for nearly 2 hours enjoying the amazing scene of a 12 foot tide. My Dad throughly enjoyed this part of the visit and said it was the coolest thing about Bar Harbor. It is amazing to think that the very path we were walking on would be 6-8 feet under water in just a few more mere hours. If our rocks would have been a bit more comfortable and we would have had a beach umbrella we may have stayed even longer. Even though we typically aren’t planners, we actually did have something else on our agenda. Not only a plan, but something new for us in Acadia — popovers at Jordan Pond House (while I say we, but really just me as popovers contain Russ’ kryptonite - gluten). Popovers are a tradition at Jordan Pond House being served since the 1890s! I was happy to share the Popover experience with my parents because growing up my Mom used to make them occasionally. She is the only reason I actually know what a popover is and I remember the special popover pan needed to bake them. Our meal was tasty, but the lack of Clam Chowder on the menu brought my Dad’s daily streak to an end, he had to settle for seafood chowder. The lack of clams in the mix, disqualified him. Sad day for my Dad, but happy day for my Mom & I as we finished off the day with ice cream from Udder Heaven. It is definitely fun playing tour guide in a location you are familiar with. It is easy to fall into a routine when you are on your home turf and there is something special about seeing it through the eyes of a newbie again. 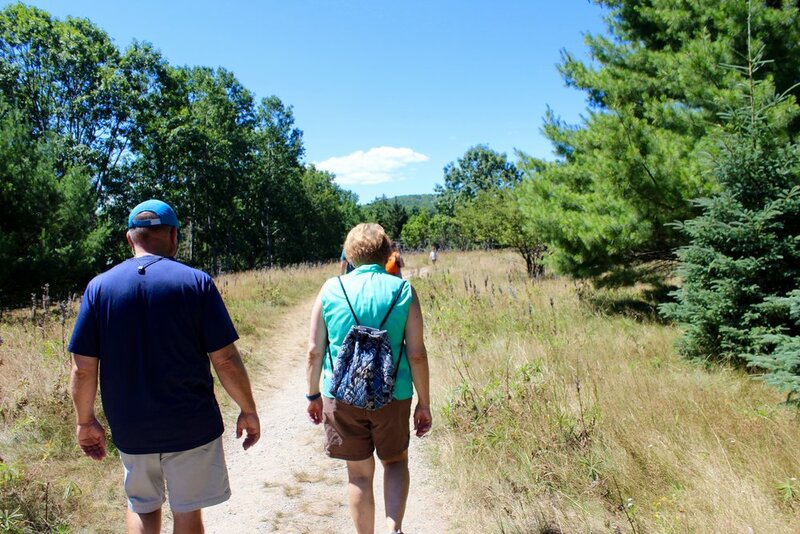 Being able to explore areas with my parents is a experience that I will treasure. Russ and I get to share with them something we love and help them understand why our wanderlust is incurable. Over the past year, we have been able to explore the familiar city of Columbus, OH and new towns of Charleston, SC and Bar Harbor, ME. Thanks, Mom & Dad, for driving 2,000+ miles roundtrip creating memories that will last me a lifetime. You always have and will always be my biggest fans! We love you.